Russia is pushing forward on a robotic mission to Mars dubbed Phobos-Grunt- now seemingly on a countdown clock that ticks away for an October launch. If the project is on track and off the ground by that time, Phobos-Gruntwould arrive at the red planet in August of next year. The project also includes deployment of a Chinese sub-satellite -Yinghuo-1meaning ?Firefly-1? - that will gauge the Martian past in terms of how surfacewater on the red planet did a disappearing act. 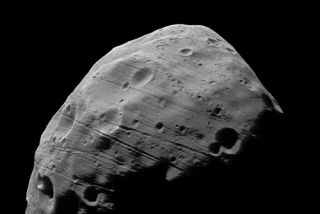 Phobos-Grunt is intended also to cast an orbital eye on Mars too, butthen plop down on Phobos - one of that planet?s two moons, scrape upon-the-spot samples and then transport those extraterrestrial tidbits to Earthin July 2012. As it swoops by Earth, the spacecraft is to release a capsule containingall the samples gathered on Phobos, to land on Earth. But what caught my eye was another payload on this heady mission - detailedin a couple of recent articles - that Russia is also dispatching on the flightthe ?world?s hardiest? or ?toughest? organisms found here on Earth, sealed upin a bio-container for the Earth-to-Mars/Mars to Earth three year trek. The bio-module will provide30 small tubes for individual microbe samples. Turns out that The Planetary Society is at the root of this ?hardy boysgo to Mars? saga - dubbed LIFE, short for Living Interplanetary FlightExperiment. LIFE is intended to help better understandthe nature of life, its robustness, and its ability - or not - to movebetween planets. The journey will be a test of one facet of the ?transpermia?hypothesis. That is, the possibility that life can voyage from planet to planetinside rocks blasted off one planetary surface by impact, to land on anotherplanetary surface. I guess what set off my buzzer was lobbingorganisms toward Mars, on purpose, given that lots of effort - and money -is involved in preventing hitchhiking microbes from Earth making it to the redplanet in the first place. It is called forward contamination. Under The Outer Space Treaty of 1967, planetary protectionpolicies are in place to prevent cross contamination between planets - avoidingboth forward contamination on outbound spacecraft, and back contamination ofEarth upon return. For this mission, it?s the possibility of forwardcontamination that raises concerns. So I shot an email over to Lou Friedman, he?s the Executive Director ofThe Planetary Society, asking him to allay concernsabout forward contamination. ?I guess the most important thing Ican say to ?allay concerns? is that...us and the Russians with whom we areworking with are committed to observing the international protocols and agreementsconcerning planetary protection,? ?he told SPACE.com. ?The main point is the product ofprobabilities of this experiment even entering Mars, let alone breaking up andthen dispersing organisms in a way that they could survive on Mars isincredibly small - orders of magnitude less than the minimum allowed in the internationalscience protocols,? Friedman advised. Asbroached in The Planetary Society?s Frequently Asked Questions about themission: Is it likely that this experiment could contaminate Mars with life,thus confusing future searches for life on Mars? ?Theshort answer is that it is very unlikely, but we are doing a thorough analysisof the issue. We will fully comply with the COSPAR (Committee on Space Researchof the International Council for Science) planetary protection guidelines aimedat preventing the contamination of Mars by introducing terrestrial life ontothe surface of Mars.? Since it?s a Russianlaunch vehicle, and not going to the surface of Mars per se, the concernsabout planetary protection are less stringent. However, if an out-of-controlspacecraft impacts on the planet, that would be bad. How would NASArespond if it were a U.S. launch vehicle with the same experiment? I alsocontacted CatharineConley, the acting Planetary Protection Officer at NASA Headquarters about thismission. ?ThePhobos-Grunt mission intends to meet orbital lifetime requirements, so byCOSPAR policy there is no official limit on the number of organisms thespacecraft may carry,? Conley advised. Sending pure cultures of organismsthat could not possibly survive on Mars, she added, would pose a minimal contaminationhazard, and this includes most organisms relevant to human exploration. ?However, Iam uncomfortable with sending native tundra samples so close to Mars, becausethis is a location on Earth that could possibly contain organisms capable ofadapting to Martian conditions,? and to do so ?seems ill-advised,? Conley told SPACE.com. For another sanitycheck, I asked John Rummel, Director of the Institute for Coastal Science &Policy at East Carolina University in Greenville, North Carolina for his thoughts.He?s also COSPAR Planetary Protection Panel Chair. ?The Planetary Society,as a public space advocacy group, is looking for a publicly noticeable way todemonstrate that live organisms can make the journey from Earth to Mars andreturn. Scientifically, however, I think that the hypothesis has already beensufficiently supported by previous work on Earth and in near-Earth space,?Rummel told SPACE.com. ?As the COSPAR Planetary Protection Panel Chair, I would judge that the threatof contaminating Mars is negligible - but I would emphasize that the RussianAcademy of Sciences is the organization that should be making thatdetermination for a Russian-launched payload, judging both the potential forcontaminating Mars and the safety of returning samples of Phobos to Earth.? So space fans: Is thePhobos-Grunt mission something to groan about? Leonard David has been reporting on the space industry for more thanfour decades. He is past editor-in-chief of the National Space Society's AdAstra and Space World magazines and has written for SPACE.com since 1999.